What This Ad Literally Says: "When your client wants the job done yesterday." What This Ad Intends To Say: If you're a fancy business consultant of some kind getting stuff to your clients fast is important and we can help with that. What This Ad Suggests: Client's are so bitchy, trust us, we can help. You like DeLoreans. Jalopnik Snap Judgment: The text is a little too small, DHL blows and we're not sure how you could get packages there yesterday. Still, DHL has such a bad reputation they should try something funny. 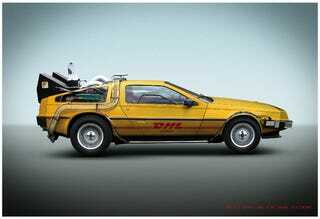 The new DeLoreans should come in yellow.